It’s a story all too familiar for some parents. You spend hours (days!) 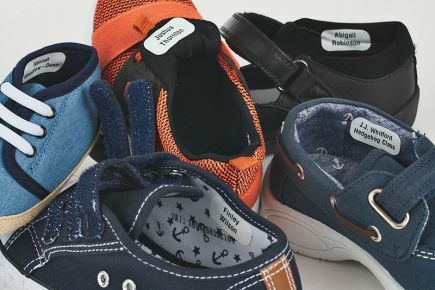 finding the perfect pair of school shoes only for your child to come home with a single forlorn shoe (or none at all), leaving you with the unnecessary expense of buying replacements. 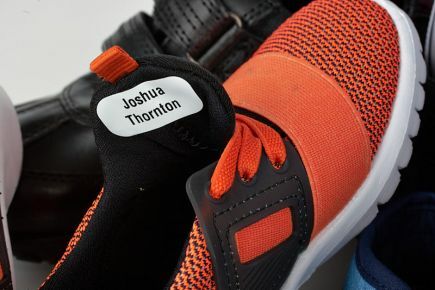 Stick on shoe labels are a simple way to help your child keep hold of their shoes – even in the chaos of the classroom, cloakroom, or changing room at home time. Stikins can put an end to the ceaseless pitter patter of tiny feet – running around looking for missing shoes! Going to school means buying school shoes as well as additional pairs for certain subjects and activity clubs (like P.E., drama, and dance). School shoes, trainers, and pumps have similar (if not identical) designs making it easy for mix ups to occur – not to mention how easy it is for shoes to fall out of bags, off tables, or to simply be put down and forgotten. Shoe labels make it simple for your child to find their own shoes (or for someone else to find and return any shoes that your child manages to lose). Stikins are extremely simple to apply. 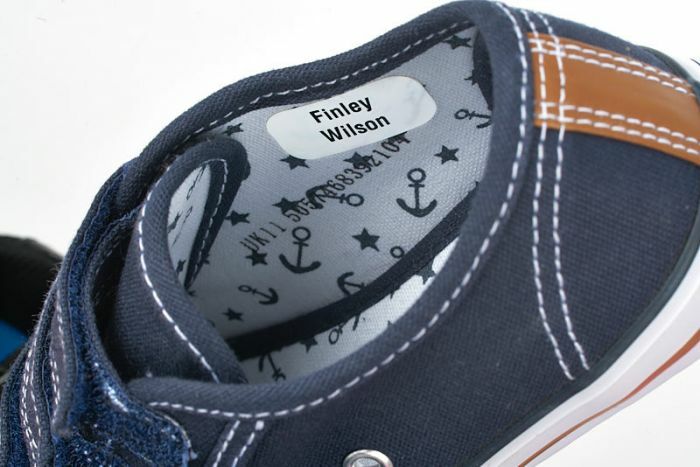 Stick your shoe labels onto the side wall or beneath the tongue of your child’s shoes. The white background and bold black font means adults and children alike can identify the owner of a particular shoe in a single glance. 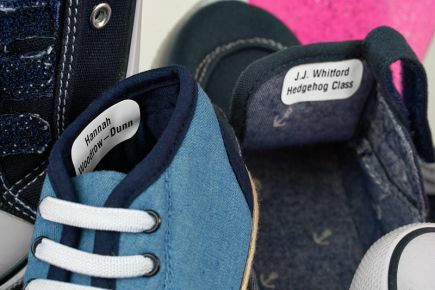 Order Your Personalised Shoe Labels Today! We currently supply Stikins name labels in four pack sizes (30 labels per pack, 60 labels per pack, 90 labels per pack or 120 labels per pack) to ensure that we can cater to every need. If you would like to purchase a personalised pack of shoe labels today, you can order online, by phone, or by post. We make and despatch shoe labels every day, Monday to Friday, up to 3pm. For more information about our shoe labels, including other ways that you can use our multipurpose labels, take a look at our FAQs and About Stikins pages, or contact us today! A member of the Stikins Team will be more than happy to answer any questions that you may have! Suitable for all footwear, including shoes, trainers, pumps, wellies, boots, slippers, sandals, and football boots. 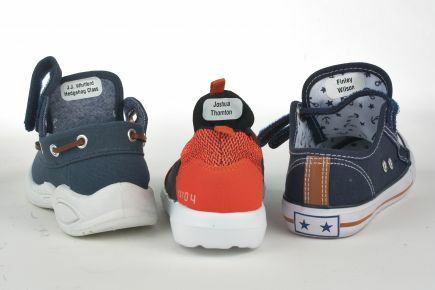 Stikins shoes labels simply stick on and stay on - with no sewing and no ironing required. 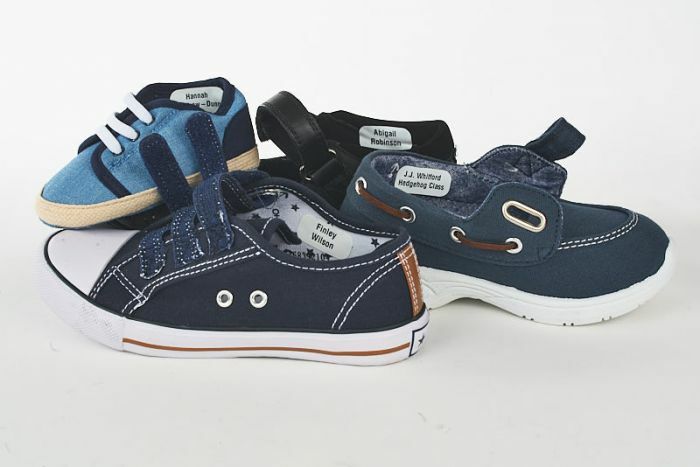 Stikins fit neatly and discretely beneath the tongue or onto the side wall of all shoe sizes. With a white background and bold black font, our labels are clear and easy for children to read. Our unique adhesive keeps shoes safely and securely labelled all year round - no matter how many steps you take! 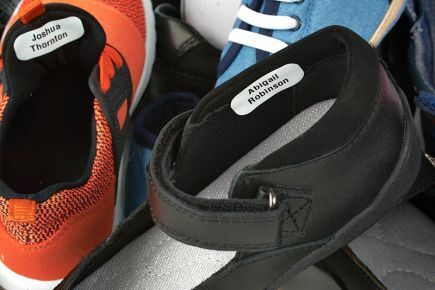 Keep track of all your family's footwear with one pack of stick on shoe labels. Use Stikins in shoes, boots, trainers, pumps, wellingtons, sandals, football boots, and slippers to keep all your family's footwear in step. Find out more by reading these reviews and blog posts about using Stikins to label all your children's assorted footwear. Absolutely fantastic labels for even the most knocked about lunchboxes and uniforms! We have used these on all parts of uniform - including gloves, hats and shoes and they are showing no signs of wear and tear despite being put through to the test by a five year old boy. Really handy for lunchboxes and bottles as well as clothes as they do not wear in the dishwasher as yet and have been washed hundreds of times. Easy to fix on, stay put instantly as far as I can tell, and arrive quickly. Highly recommend. I purchased these for my son when he started reception, I’m so happy I have now purchased for my other son in nursery and for my other relatives, they stick to clothes, lunchboxes, bags, shoes etc. I’ve bought Stikins for many years now, they are so versatile as they can be used on both clothing/shoes and equipment e.g water bottles etc, I’m often asked where the labels are from and have no hesitation in recommending them. I thoroughly recommend these labels. We have been using Stikins for a couple of years now and they are consistently excellent. They stay in place and don't fade after loads of washes. I even use them in wellies and other shoes with no problems. I've been using Stikins for about 5 years now and I can't recommend them enough. 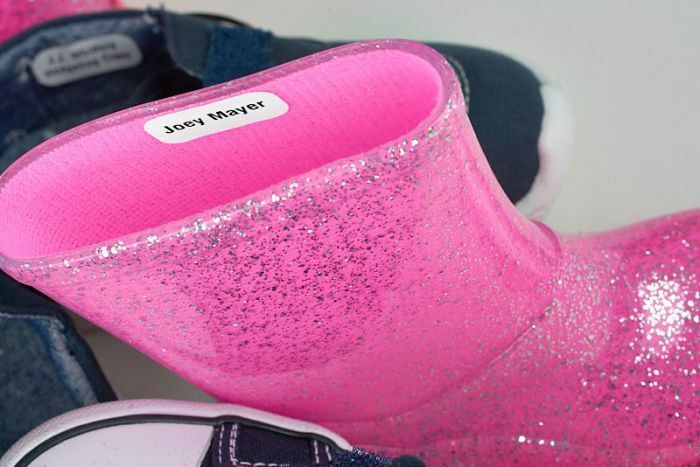 Easy to use and lasts through all the wear and washes of school uniforms (even on the inside of shoes!) I've never been disappointed. Fantastic, wash after wash after wash, best thing ever for labelling clothes, shoes, bags, lunch boxes, drink bottles. Takes literally years for them to eventually crack and need replacing. Love them! Fantastic product! Have used them on all items, uniform, shoes, drinks bottles, lunch bag, all still in place after a whole year. Ordering more for new uniform! I’ve been using stikins for last 4 years and they age absolutely amazing! I use them on clothing, shoes, water bottles, snack pots and they never come off! Would highly recommend them to anyone! These labels are the best , I keep raccomanding to other people as they are so useful. They last forever and I stick them on other items like school bags, water bottles, books, lunch boxes and shoes. I have used these stickers every year for my son's school stuff. Clothes, bag, shoes, water bottles - they are brilliant! Would not use any other.